Last week, I had written about how only 6% of Singaporean university undergraduates receive scholarships. But this isn’t even the real issue. Read on to find out why. According to the Ministry of Education (MOE), “on average, about 14% of our undergraduates … in NUS (National University of Singapore) and NTU (Nanyang Technological University of Singapore) in 2001-2005 were on scholarships“. Of these, only “About one-third of the undergraduate scholars were local students. Also, as only one-third of those are scholarships are Singaporeans, this would mean that only 2,308 Singaporeans would receive scholarships. However, there are 40,560 Singaporean (and PR) students, which means that only 6% of these students were on scholarships (Chart 1). Some commenters have suggested that 52% of foreign students had received scholarships because they might be performing academically better, and might thus have received the bulk of the scholarships. It was revealed by the MOE that, “of all the international students who graduated from our Autonomous Universities in 2011, around 45% did so with a second upper class of honours or better“. Senior Parliamentary Secretary for Education Sim Ann who is the Senior Parliamentary Secretary for Education had also said that, “only 32 per cent of Singaporeans do as well“. 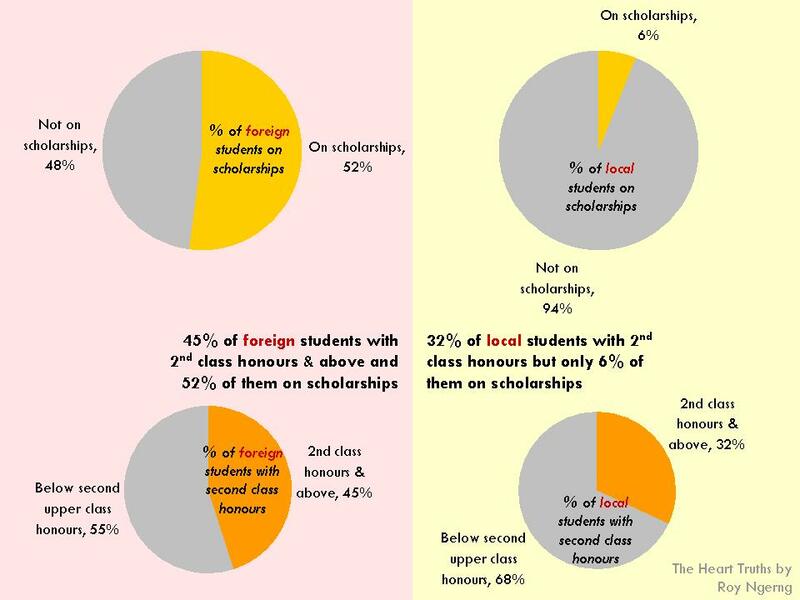 So, if there were 52% of the foreign students who had received scholarships and 45% of them had obtained second upper class of honours or better, doesn’t this mean that since 32% of Singaporean and PR students had obtained second upper class of honours or better that up to 40% of Singaporean and PR students should be on scholarships (Chart 2)? 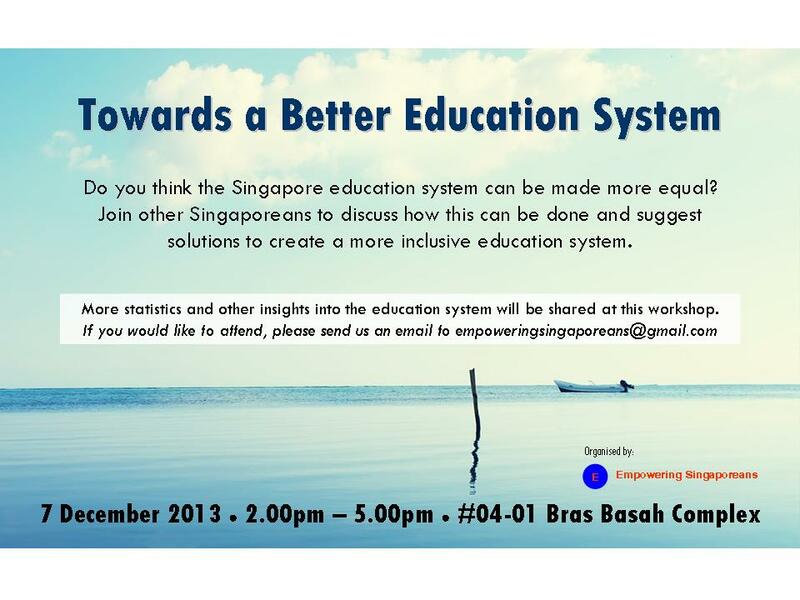 Why then are there only 6% of Singaporean and PR students on scholarships, instead of 40%? Something is terribly amiss here, isn’t it? There are at least 32% of deserving Singaporean students who should be receiving scholarships but who are not given a fair chance at it. Meanwhile, the PAP government has chosen to give scholarships to the foreign students, instead of deserving and needy Singaporean students instead! Already, it is estimated that there are 28% of Singaporeans living in poverty. Thus, of the Singaporean students who enter the local public universities, would there be 28% who would have difficulties paying for their university fees? 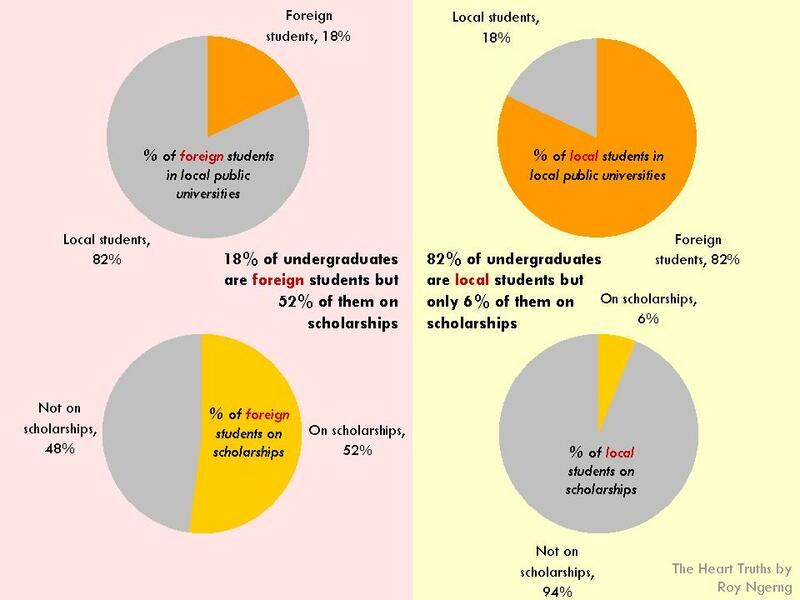 Thus if there would be 32% of Singaporean students who would be deserving of a scholarship, based on how MOE had apportion the scholarships to foreigners, and if there would be 28% of Singaporeans who would need financial assistance, then why is it that only 6% of Singaporean and PR students are able to obtains scholarships? Why has the PAP government made it so easy for the foreign students to receive scholarships but for equally deserving Singaporean students, they are made to pay their own way and have to graduate “with an average debt of about $20,000“? Don’t you think that something is severely wrong here? As I’ve written, among the unemployed workers in Singapore, a massive proportion of them are tertiary-educated Singaporeans. If this is the case, shouldn’t the MOE’s responsibility be first to grow the pool of tertiary-educated Singaporean students, and reimburse them first and foremost before giving scholarships to foreigners? Shouldn’t the PAP government build a core of tertiary-educated Singaporeans, instead of importing and funding for the education of foreign students, while leaving Singaporean students to fend for themselves, and causing burgeoning unemployment among the tertiary-educated workers in Singapore? Is this how the PAP government should be treating Singaporeans – Singaporeans who have a stake in our country and who would need the support from the government to receive adequate education and then contribute back to Singapore? Why is the PAP government not supporting Singaporeans but is instead giving away money to foreign students – in the hope that they would stay and contribute to Singapore? I would be proud if my government is able to treat people in our neighbouring countries with respect and readily extend our support to them. However, when the PAP government isn’t even able to look out for its own citizens, but would choose to look out for the citizens of another country first, isn’t something not quite right here? Where is the responsibility of the PAP government? Singaporeans – or rather 60.1% – had voted for the PAP because we expect the PAP to be able to look out for the needs of Singaporeans, but why is their priority on foreigners and not on Singaporeans? Also, there are no levies or quotas to the hiring of workers on Employment Passes and in the Fair Consideration Framework that the Ministry of Manpower (MOM) had introduced, because the MOM had said that it “does not review the merits of a firm’s hiring decision, as the firm is best placed to decide on which candidate can do the job,” which would mean that this “framework” – and not a law – wouldn’t protect Singaporean workers as well. So, from all these policy decisions by the PAP government, it is clear that they do not seem to be interested in protecting Singaporeans, even as Singaporeans are equally deserving or in need of assistance from the government that we had voted in, precisely to help us for. Yet, the PAP government seems to have relegated it’s responsibilities, in not providing enough scholarships for Singaporean students, and in not enacting adequate policies and laws to protect the employment of Singaporean workers. As a Singaporean, I am very worried. If the government that the majority of Singaporeans have voted for has chosen not to perform its duty and responsibility, then who else do we have to look to, to protect our lives and livelihood? Should we ask the Malaysian or Indonesian government to take care of us instead? If the PAP government is not able to perform its duty as its elected responsibility, should we then vote to put in other parties in government who would actually perform their duty and protect the rights and needs of Singaporeans? I am very worried now. Are you? The reasons why many MOE teachers resign from schools even though they love teaching is the MOE’s system. These are reasons which are apart from teachers going on maternity leave or to take care of younger children of their own. 1. The EPMS (Enhanced Performance Management System). This was enhanced from the then PMS. This caused a lot of unhappiness among teachers in the primary and secondary levels as teachers are appraised and pit against fellow teachers within the same substantive grades where grading is often on whether teacher had won an award for their CCAs or won competitions for their departments. All blame for a pupil who doesn’t want to learn is laid on the teachers. This causes extreme stress. In essence, the politics of appraisal tears the fraternity apart into competition with each other for higher performance bonuses instead of cooperation. Sincerity gets diluted and teachers become suspicious of each other at times. EPMS has to be removed but the ministry is deaf on this even when it is highly noted on teachers forums. Teachers given all Normal Technical or Normal Academic classes and are not given a fair mix of classes of the good and challenging students. These teachers become emotionally unwell when they are tasked with all challenging classes and HODs are to blame for this. These teachers fall sick often and many teachers suffer from high blood pressure. Teachers end up marking in the night each day and work throughout the weekend and do not get enough rest due to the unprecedented administrative and meetings and workload apart from actual teaching. Teachers only find time to mark at night. They work at 7 am till 5 or 5.30 pm. And they return home to mark. No work and live balance in MOE schools. Not all schools are good schools. There are many schools with disciplinary issues such as Changkat Changi Sec, Kent Ridge, Regent Sec or Northview Sec, etc. These schools have serious disciplinary issues that affect teaching and learning and thus the emotional well being of teachers. Some teachers are emotionally provoked on a daily basis because of these disciplinary issues and many leave because of this reasons as principals do not support their teachers. Conflict of interests happen often in scenarios such as the above causing a lot of unhappiness in the schools. We have heard of teachers being promoted by their spouses. The ministry needs to be fair and relocated a spouse when this happens.